and Adult Residential Facilities (ARF). We provide easy to use software for the Mental Health and Child Development industry. We have over a dozen years of experience and understand how difficult it is to provide great treatment to individuals as well as accurate reporting to their families and the state. Our goal is to help Group Home/Day Program Agencies and Educational Programs increase their effectiveness in treatment while saving time and reducing costs. Millions of medications successfully administered! Track, trend, and graph: Individual progress notes, interventions, goals, medications, and incidents. Automated Service Billing: Create billing reports including activities, mileage and hours for individuals. Medication Reminders: Get notification of medications that need to be administered to the individuals. This will help staff insure that they administer the right medication to the right individual at the right time. 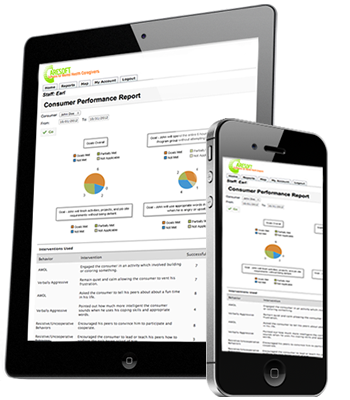 State required reports are fully customizable and can be created for your individuals with the touch of a button. Customizable Treatment Plan (ISP, IPP, ITP, IEP) reports that can be printed or emailed instantly. Upload and store important files and documents for your individuals, staff, and agency. QuickBooks is a popular accounting choice for organizations, so CareSoft provides an export feature so you can transfer financial data – Service Log, Billing and customer records from CareSoft to QuickBooks. Verify staff is entering timely data, picking up individuals, and billing mileage correctly. Cloud based and can be used with any device that has internet connection: phones, tablets, or computers. Intuitive interface that uses vocabulary our industry understands. Easy to set up and use. Free training offered to staff and administrators.